Mo Barrow scored in stoppage time to give struggling Reading a point against Stoke City. A wonderful volley from Tom Ince looked set to give the visitors a second successive win before Barrow's first goal of the season earned a vital point for Paul Clement's side. 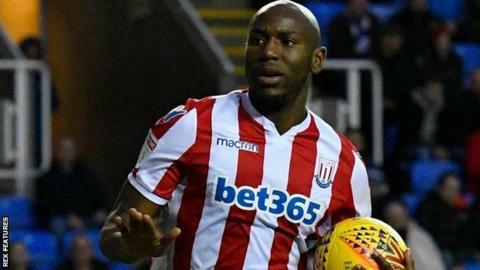 The Potters should have taken an early lead but first Benik Afobe headed Joe Allen's cross wide and then Sam Clucas fired over a rebound after Ince had seen a shot saved. Marc McNulty made them pay for their lack of cutting edge when he headed home from an Andy Rinomhota centre just before the break. Afobe made amends for his earlier miss with a cool finish to level for the visitors before Ince's sensational strike put them in front, only for Barrow to steal a draw at the end. The point stopped the Royals from slipping back into the Championship relegation zone, though they remain out of it on goal difference only. Stoke are now unbeaten in seven matches, but four draws in that run means they are seven points outside the play-off places. Gary Rowett's side host bottom side Ipswich, managed by former Potters boss Paul Lambert, next Saturday, while the Royals host promotion-chasing Sheffield United. "At times, our game management is not as good as we'd like it to be. To concede goals late in each half, when we had opportunities not to concede those goals, was disappointing. "We've had seven or eight really top opportunities but, after going 2-1 up, we should really see the game out. "We should've been going away with all three points. It's almost criminal that we aren't." "To score that late, I thought it might have got away from us. I'm glad the players didn't think that. That's the most important thing. "We finished the game strongly and, over the last two games, the players have not been downing tools. "If we can string together some good performances, the results will come. I'm convinced of that." Match ends, Reading 2, Stoke City 2. Second Half ends, Reading 2, Stoke City 2. Goal! Reading 2, Stoke City 2. Modou Barrow (Reading) left footed shot from the centre of the box to the bottom right corner. Assisted by Yakou Meite. Offside, Reading. Andy Rinomhota tries a through ball, but Yakou Meite is caught offside. Bruno Martins Indi (Stoke City) wins a free kick in the defensive half. Corner, Reading. Conceded by Ashley Williams. Corner, Reading. Conceded by Ryan Shawcross. Attempt saved. Yakou Meite (Reading) right footed shot from the centre of the box is saved in the centre of the goal. Assisted by Andy Rinomhota with a through ball. Substitution, Stoke City. Ashley Williams replaces Sam Clucas. Andy Yiadom (Reading) is shown the yellow card. Attempt missed. Tiago Ilori (Reading) header from the centre of the box is too high. Assisted by Garath McCleary with a cross following a set piece situation. Foul by Sam Clucas (Stoke City). Andy Yiadom (Reading) wins a free kick on the right wing. Benik Afobe (Stoke City) wins a free kick in the attacking half. Substitution, Stoke City. Darren Fletcher replaces James McClean. Attempt missed. Modou Barrow (Reading) left footed shot from the left side of the box misses to the right. Attempt saved. Joe Allen (Stoke City) right footed shot from the right side of the box is saved in the top centre of the goal. Assisted by Benik Afobe. Attempt missed. Leandro Bacuna (Reading) right footed shot from outside the box is high and wide to the right. Assisted by Chris Gunter following a set piece situation. Substitution, Reading. Sam Baldock replaces Danny Loader. Substitution, Reading. Yakou Meite replaces Marc McNulty. Garath McCleary (Reading) wins a free kick on the right wing. Goal! Reading 1, Stoke City 2. Tom Ince (Stoke City) left footed shot from the centre of the box to the top left corner. Assisted by James McClean with a cross. Attempt blocked. Leandro Bacuna (Reading) right footed shot from outside the box is blocked. Assisted by Danny Loader. Substitution, Stoke City. Thomas Edwards replaces Erik Pieters because of an injury. Substitution, Reading. Modou Barrow replaces John Swift. Foul by Ryan Woods (Stoke City). Danny Loader (Reading) wins a free kick in the attacking half. James McClean (Stoke City) is shown the yellow card. Offside, Stoke City. Cuco Martina tries a through ball, but Benik Afobe is caught offside. Corner, Stoke City. Conceded by Tyler Blackett. Attempt blocked. Benik Afobe (Stoke City) right footed shot from the centre of the box is blocked. Assisted by James McClean.